It's time for another new challenge over at CCM. I honestly don't know where the last fortnight has disappeared to. I feel like I only just finished the card for the last challenge, and here we are with a new one. 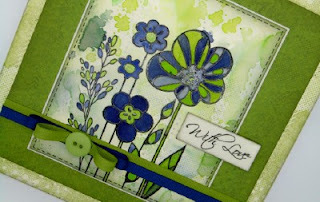 This challenge is Go Green and our host Judy is looking to see lots of lovely lush green on your creations in honour of St. Patrick's Day which is on Friday 17th March. 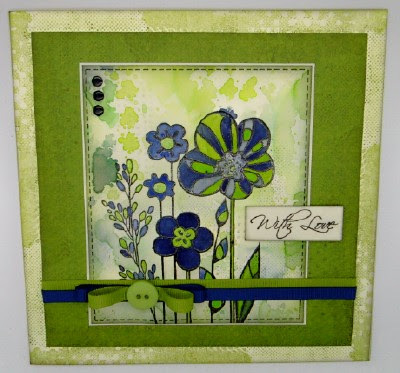 As usual anything you care to enter is fine, a card, scrap layout, mixed media piece, some home decor, as long as it's either mostly green or has a St. Patrick's Day theme. Now I don't do St Patrick's Day, so I have gone with a card with plenty of green on it. 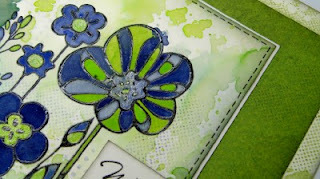 The central image is by Hobby Art which I stamped and embossed onto a piece of mop up background from my stash. I coloured the image with distress inks, and added some faux stitching and a little bit of sparkle with a starlight pen. I have a rather large stash of ribbon, what a surprise I can hear you say :O), so I managed to find some that matched the colouring, as well as a plain green button. 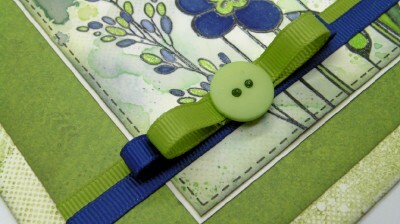 I hope that you will find the time to join us with your Green creations or St Patrick's Day cards. Don't forget to stop by and see what the rest of the team have made to inspire you.